I skipped the Five Reasons column last week after the Palace defeat as things were just too cheerless. I couldn’t be bothered. Four losses on the trot. Reasons to be cheerful? No sir. The point against Southampton from the lacklustre 0-0 draw, which saw Villa register just a solidarity shot on target, suggests Villa will limp along to safety. Three more points from Villa’s final four games are potentially needed to make sure of safety. 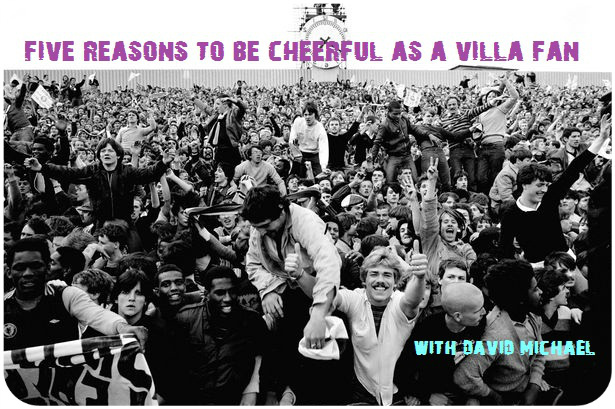 Events off the pitch though suggest there maybe some real reasons for Villa fans to truly be cheerful soon. 1. Randy Lerner is alive. After months of silence, the Villa chairman issued two ‘statements’ within the space of a week. A week in which, also saw statements from the Aston Villa Supporters’ Trust and Paul Faulkner. The upshot of Lerner’s particularly petulant and ambiguous second statement it seems, is the club is either being sold or more financial muscle is being brought in. Lerner has told us we’ll have to wait until the end of the season to find out. 3. To those wanting Lambert out, the removal of his management team is a big indicator that he could be next. Either Lambert is a gonna at the end of the season or he’s fighting for his life. He got 41 points last season and even the club’s PR team wouldn’t dare consider anything less than that as progress. 4. Against Southampton at least Villa managed a rare clean sheet which may help instill a bit of confidence for the last few games, where they may need to still grind out a result or two. 5. There still seems to be a Baggie buffer between Villa and the relegation zone. friends, romans and fellow fans… the soap opera begins? It never stops! As Graham Taylor said when manager, there is always politics at villa park. And as for the baggies, watching what happens at the hawthorns is a part of our history. My grandfather was allegedly convinced that our goalie threw the 1892 cup final to let baggies win it, according to my dad. Who was also convinced that they are our real enemy, though he was not born in 1892. FOrget the Peaky Blinders (fortunately moved to Garrison Lane by tele – they were actually in Summer Lane, our patch, or so my mother told me) – the real drama takes place at Villa Park.